Width - 50cmMain Oven - 41 Litres4 Gas Burners12 Months GuaranteeGas cooking that can stand on its own two feet. 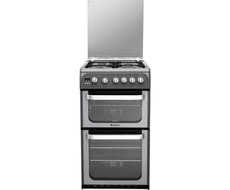 The freestanding Hotpoint HUG52X_SS is graced with a very..
Gas cooking that can stand on its own two feet. The freestanding Hotpoint HUG52X_SS is graced with a very classy stainless steel finish and the list of features it holds is rather impressive. It has a 41 litre conventional gas oven with catalytic liners and double glazed doors, a 19 litre variable grill compartment and a 4 burner hob with enamelled flat wire pan supports and a toughened glass lid. Comes with a 1 year labour and 5 year parts guarantee.